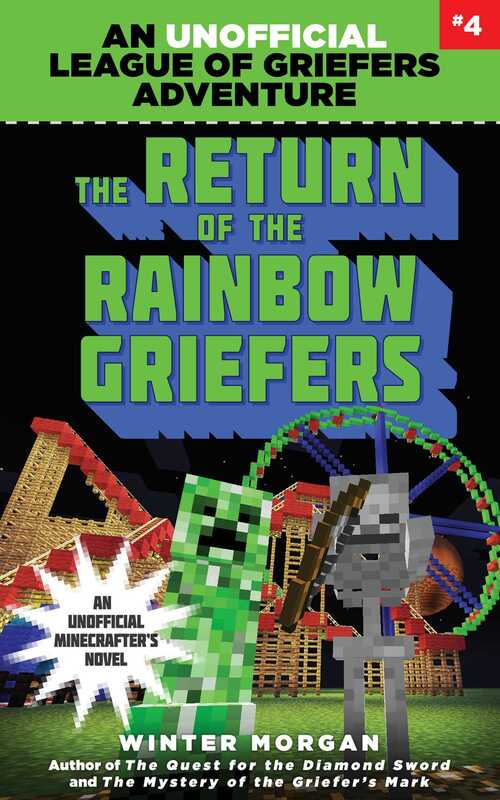 Will Noah and Violet finally defeat Daniel and his crew of rainbow griefers? Violet and Noah’s village is celebrating the new amusement park opening in town. Everyone is enjoying the fun rides and tasty food. But when Noah spots a rainbow griefer in the village carrying blocks of TNT, the celebration suddenly stops. Before the townspeople can do anything about the dangerous interloper, the roller coaster explodes! The accident with the roller coaster is blamed on Noah and Violet’s frequent enemy, Daniel. The duo must stop Daniel and his new crop of rainbow griefers before they do anymore damage to the villageor the world of Minecraft. Things get tricky when Noah and Violet get a message from an old friend who needs their help. Can Noah and Violet come to the aide of their friend while saving their village? It will be a team effort to stop the rainbow griefers in this battle, but are the Minecrafters up for the challenge? Find out in this thrilling fourth installment of the League of Griefers series!